To be the premier rep agency in our territory that sells and specifies equipment, furniture and supplies for the foodservice industry based upon our solid reputation and ability to deliver results. To protect and enhance the corporation’s high level of ethics and conduct. To maintain a strong people orientation and demonstrate care for every employee. To attract and hold customers and consumers with products and services of consistently superior quality and value. To sustain a strong results orientation coupled with a prudent approach to business. For more than 40 years, Squier Associates has brought its attention to detail and dedicated personal service to the foodservice industry. From the beginning, the goal has always been to listen to our customers and to find the right solution to meet their needs. This has led to many firsts for Squier Associates. 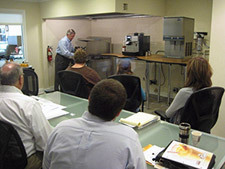 We were the first rep firm in the area to open a test kitchen at our office and warehouse facility in Rockville. 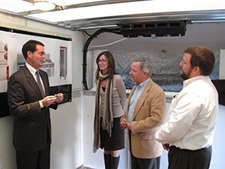 We were the first rep firm to put a mobile showroom on the road to bring leading foodservice equipment to more than a thousand of our customers - saving salespeople precious time and allowing non-sales employees to see and learn about the benefits of our equipment. It is our continual quest to find new and better ways to serve our customers and manufacturers that has led to an average tenure of more than 20 years with the factories we represent. It is also what has led us to launch Dining Essentials. This new brand gives the attention to detail and dedicated services expected of Squier Associates with a focus on smallwares, tabletop, and furniture. Please check out Dining Essentials by clicking on the link below. We are proud of what our customers and clients have to say about us in the testimonials to the right. Let us serve you as well. "Squier Associates are true professionals. Quality products and fast quality service." "It is a pleasure to work with Squier Associates. Their professionalism and follow through are what drives our customers' satisfaction. They continually go above and beyond. Their support and partnership is greatly appreciated." "Responsive, knowledgeable, and honest are some of the adjectives the consultants at FoodStrategy would use to describe Squier Associates. FoodStrategy is pleased to have Squier support equipment in the facilities we design in the region. We know Squier will support us and the equipment they represent, ensuring a satisfied client." "Squier Associates is the most professional factory rep firm we deal with. When it comes to product knowledge, quick response, and timely follow-up, no one is in their class. They have some of the best lines in the business. SA provides the information you need without the feel of a worn-out sales pitch and a professional integrity which we greatly appreciate and respect." "Since partnering with Squier Associates I could not be more pleased. They have professionally managed the Vulcan, Wolf, and Berkel brands, exceeding expectations. Their marketing efforts on our behalf have positioned our products for maximum exposure and our company for growth. I truly appreciate all that the Squier Team does for the Vulcan Food Equipment Group." "Follett Corporation has partnered with Squier Associates for many years. Their professionalism, attention to details, sales expertise and integrity are all strong and consistent characteristics that make their firm an essential extension of Follett Corporation as we work together to successfully grow our business. I completely trust their ability to successfully represent Follett Corporation on the most sensitive and complex customer issues. And, their feedback from the marketplace is instrumental to our development of new products and services that add value to our customers. They are truly the best!"